No colour matching is required as we manufacture the colours that are first used on many 'rub' off leathers. There are only a limited range of colours used all of which we have in stock. The antique finish kit has been designed as a simple to use and very effective kit for re-applying the top coat colour to 'rub' off leathers. Rub off leathers are leathers where there is a top coat of colour applied, normally a very dark colour such as a deep red, green, blue or brown. This colour is designed to actually rub off as the leather ages. This often gets out of hand and customers are left with very light patches that can look terrible. This is extremely common with Chesterfields and old Antique style sofas. How it works: Rub off leathers are made by the leather being dyed and then finished with leather paints. This is known as the base colour and is usually a bright colour such as, red, green, blue, tan and brown. A strong lacquer is then applied to seal the colour in. A second coat is then sprayed on top of the lacquer. This coat is a very dark version of the base coat, like a deep red (oxblood) or deep green.....this colour is almost black. 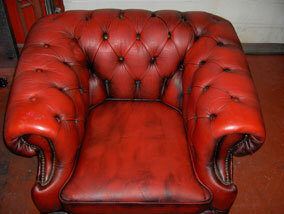 The colour is sprayed onto the leather in order for it to allow the base colour to show through creating an aged look. Normally the buttoned areas and edges are sprayed much darker than the other areas. The problem occurs a few years down the line, when with use, the dark top coat colour starts to wear away exposing the bright base colour beneath. This creates patches of bright colour making the leather look very patchy and odd. 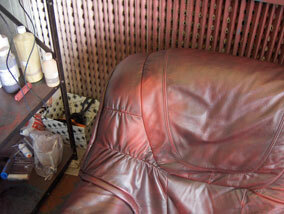 It is simply fixed by spraying the top coat colour back onto the leather. Alcohol Cleaner: To prepare the leather for colour. Top Coat Colour: Choose from the list of colours for the right colour to re-apply the finish. 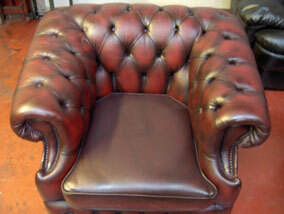 Leather Finish: A professional finish to seal the colour in. Airbursh & Gas Can: Used to spray the colour and finish onto the leather. Cloth: Used to apply the protection cream and buff over in between coats of colour and finish. Instructions: Detailed guide to help you get the best results possible. The colour used to restore this chesterfield arm chair was top coat colour red, and it was sprayed on in the correct pattern to give an aged antique look. 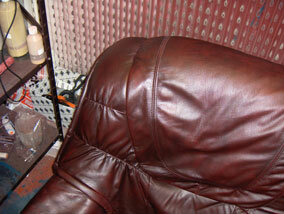 In the photos above, we have used the antique finish kit to repair one small area of a rub off leather. The colour used was red. I just wanted to let you know that this arrived yesterday and I am absolutely delighted - I cannot believe the transformation in my armchair, which I was about to throw away. I wouldn't normally believe the 'before and after' pictures, but if anything, this is more astonishing than the hype! Thank you very much from a satisfied customer! This is for touching up small items of furniture. It is enough for a single arm chair or for repairing chemical spill damage, e.g. nail varnish remove spill. Bought individually this kit would cost over HK$1,030. This is for re-antiquing rub off leathers. There is enough to do a three piece suite. Bought individually this kit would cost over HK$1,230.